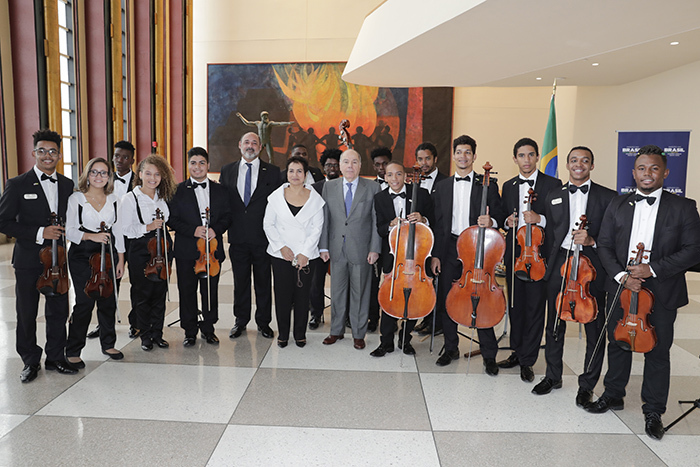 United Nations, New York, USA, May 16, 2018 – Brazilian Classical Music Concert by the Group Youth Camerata of Rio de Janeiro today at the UN Headquarters in New York City. UNITED NATIONS, May 16 — Many musicians have come to the UN and played, and garnered applause. But on May 16 it was young people from Brazil’s slums or favelas, organized into the Camerata Jovem Do Rio de Janeiro, who played in the UN General Assembly lobby, to thunderous applause. Brazil’s Mission to the UN sponsored the event, held at 1 pm in the afternoon under the iconic Sputnik above with a Greek sculpture behind. The group included 14 musicians, ages 14 to 20, all residents of lower-income communities in Rio de Janeiro known as favelas. They played pieces by Brazilian composers Pixinguinha and Ary Barroso, and European classical music compositions by Mozart and Bach. This was not new for them: in 2017, the Camerata went on tour to Germany and Holland. They took classes with the Munich Symphony Orchestra for a week and performed at the Wallraf Richartz Museum in Cologne and the Concertgebouw in Amsterdam. They are supported by Ação Social pela Música do Brasil (Social Action through Music of Brazil), founded 22 years ago with a mission to promote social inclusion and cultural education through the teaching of classical music. The musical director Camerata Jovem Do Rio de Janeiro. Fiorella Solares, has said of Brazil that “it has never been possible here to united musicians of different classes in orchestral ensembles because there were never any classical musicians in the poorer classes. Now, because of our programs, it is actually possible for the first time in Rio’s history to see a mix of really great musicians from all social classes — including Afro-Brazilians. Youth Camerata of Rio de Janeiro, Ambassador Mauro Vieira. United Nations, New York, USA, May 16, 2018 – Brazilian UN Ambassador Mauro Vieira During the Brazilian Classical Music Concert by the Group Youth Camerata of Rio de Janeiro today at the UN Headquarters in New York City. 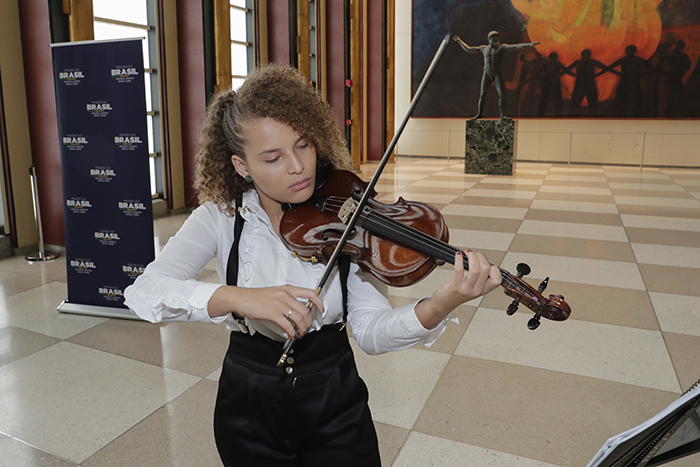 It is worth listing the young musicians who came and played at the UN on 16 May 2018 – you will be hearing from them again: on 1st Violin it was Gabriel de Jesus da Paixão, Anna Eliza Ribeiro, Moraes and Carlos Samuel Galvão Ribeiro. On 2nd Violin it was Mariana Pereira da Silva and Antônio Henrique da Silva. On Viola, it was Natanael Jesus da Paixão, Victor Lucas Pacheco Freitas, and Renan de Paula da Conceição. On cello it was Rodrigo Cunha da Silva and Jean Barreto da Costa. On bass it was David Nascimento. On flute it was Luiz Felipe Vieira Pereira. On percussion it was Carlos Moisés Galvão Ribeiro and Marcos Afonso Souza Andrade. The director Solares, originally from Guatemala, came to Brazil early and acquired Brazilian citizenship. During a notable career as a cellist in the Symphony Orchestra of the Theatro Municipal in Rio de Janeiro, she married the Brazilian conductor David Machado. Together, they founded the “Ação Social pela Música do Brasil.” Following Machado’s death in 1995, Fiorella persevered in the work and today maintains the organization, helping spread classical music to all audiences, including in the favelas.